Friday's session accomplished nothing in SPX, but we do have an interesting development in BKX. The last time I updated the BKX chart was in July, and I noted that I was inclined to think red iv was still unfolding. Since then, I've been wondering about the wave structure here, because blue V should be an impulsive five wave rally, and it has had the appearance of 3 waves instead. That leaves open the potential that the most recent rally in BKX was not part of wave V, but was instead the still-unfolding wave iv. 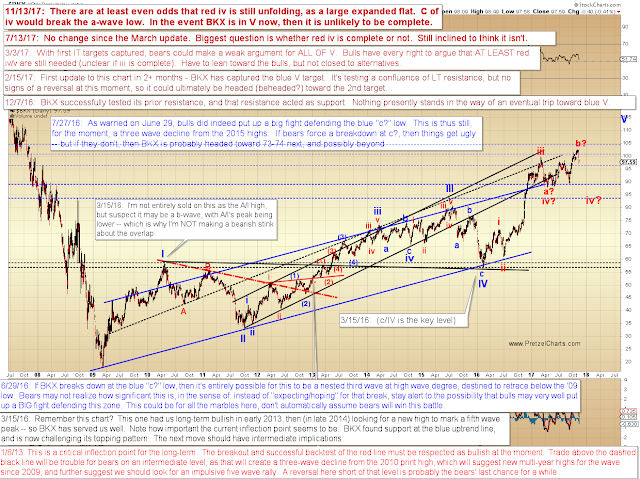 The new high in 3-waves would fit the expectations of an expanded flat, and suggest a trip back below the a-wave low. Now, if wave iv is still unfolding in BKX, then that would suggest a decent decline is pending there. And that would likewise have implications that SPX is also still working on a large fourth wave, which is represented by the bottommost black 4 on the chart below -- but could easily run lower than shown (and probably would, in fact). 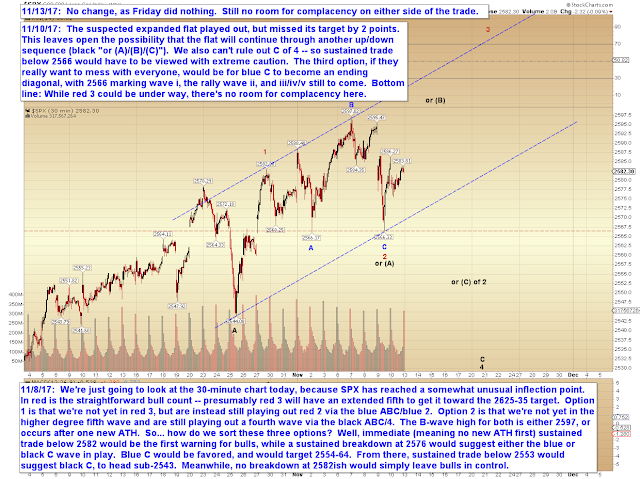 These types of moves are quite challenging to anticipate, because there really is nothing to differentiate them until they start breaking up or down -- but we are at least wise to the potential fairly early in the game, especially relative to the ideal size for this wave. As I warned last update: If SPX sustains a breakdown at blue C, that would have to be viewed with extreme caution. And now we have one more reason for thinking so. 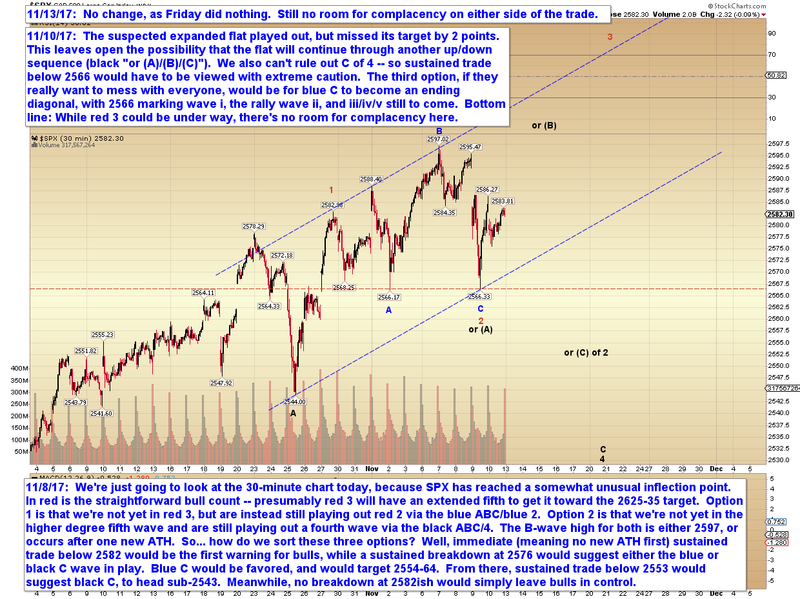 The classic target for an SPX breakdown would be 2537 +/-, but that could easily run into the 2400's. The biggest challenge when you start dealing with expanded flats is that you cannot bank of a fifth wave at the anticipated C-wave decline -- because that "expected" c-wave could instead be another b-wave, and end up as three waves that lead to another up/down sequence. So please keep that in mind in the event of a sustained breakdown. The good news is that even if the decline were to be another b-wave, we should still theoretically be able to bank on a wave of at least equal length to the first leg down, likely longer. Trade safe.